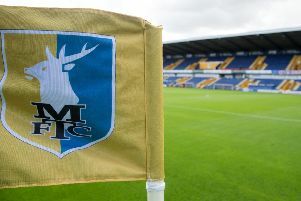 Mansfield Town manager Adam Murray took his side to Nottingham’s Escape Rooms this week to help build team relations in a week in which he also banned mobile phones from the building. Concerned by his side’s poor communication on the pitch last weekend and the number of new faces from the summer he feels are still to really settle in, Murray whisked the squad for a fun-packed day escaping ‘earthquakes’ or the ‘butcher’s knife’, which he felt worked a treat ahead of Saturday’s game at Luton Town. “We have had a really good week this week,” smiled Murray. “We had a team-building exercise on Tuesday which was fantastic and one of the best we’ve done. “We went to the Escape Rooms in Nottingham and it was incredible. We broke the lads into teams of four and five. “There are different themes to each room and there are five rooms. You’ve got an hour as a team to work out how you’re going to get out of the room. “One room was something like an earthquake and halfway through the time a big wall comes down and shuts one of your team in a separate part and you have to work out how to get him out before he ‘dies’. So we had to save him. “Then there was the ‘butcher room’ where the butcher was coming back to kill you if you didn’t get out. So we locked them all in that room! Murray enjoyed watching the reactions of his players and seeing characters emerging. “It was quite comical actually,” he said. “The staff didn’t do it as we wanted it to be a player thing. But we actually got to watch it on CCTV. “I won’t go into some of the things I’ve seen, but we saw people hiding in corners! It was good to see the characters come out. “It was fantastic, then we went for a meal – all little things. “We were massive on it last year. We did stupid things last year like ‘Date Night’. “It brought the team together and I think, because it hasn’t gone a smoothly as wanted and with the 11 or 12 players we’ve brought in, we only planned to bring about half of that in.